While it may be fun to be a disrupter, it’s not so fun to be the disruptee. What happens to organizations that have their entire industry shaken up? What can these businesses do to prepare for and respond to disruption? 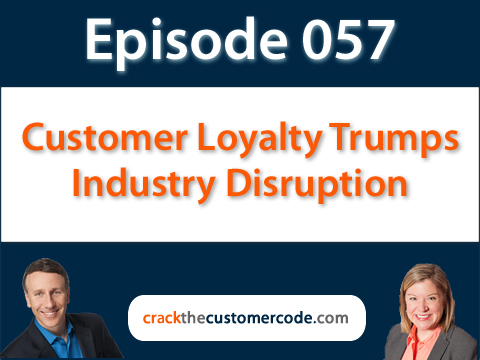 Jeannie and Adam tackle industry disruption, customer experience, and loyalty. Having a happy, loyal, dedicated customer base is one of the best remedies to industry disruption. While customer loyalty alone won’t save a brand from sinking, coupling it with infrastructure and technological improvements may, and this strategy is better in the long term than seeking legislation to hold onto your once glory days (we’re looking at you, cable). Your competitors are setting customer expectations in your industry. If your business can’t deliver on the newly-formed expectations stemming from innovation in the industry, you will find customers increasingly more likely to defect. If your industry is being disrupted there are many things customers do to keep competitive advantage, but cultivating customer loyalty is the strategy that lasts. So how can you implement customer loyalty strategies to protect your business from industry disruption?